It was speculated that the Galaxy C10 smartphone was gonna be announced back in the third quarter in 2017. However, the South Korean company did not unveil it last year. Previous rumors have claimed that the Galaxy C10 has a model number of SM-C9150. 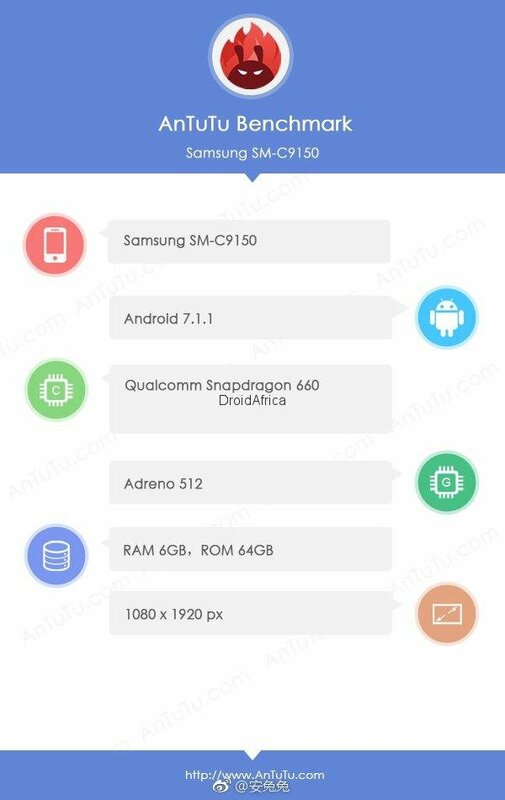 Since a Samsung phone with the same model number has shown up AnTuTu benchmarking site, it seems that the arrival of Galaxy C10 is drawing near. Early rumors from the start of the previous year had claimed that the Galaxy C10 (SM-C9100) and Galaxy C10 Plus (SM-C9150) will be launching together. However, a well-known tipster had later claimed that Samsung had killed the SM-C9100 project and a recent tweet from the same leakster states that the Galaxy C10 Plus moniker has been dropped. Hence, the SM-C9150 is likely to launch as Galaxy C10. The AnTuTu listing of SM-C9150 has revealed that it will come pre-installed with Android 7.1.1 Nougat. As previous rumors have claimed, it is fueled by Snapdragon 660 and 6 GB of RAM. Its display will be support full HD resolution of 1080 x 1920 pixels which suggests that the handset won’t be featuring the trendy full screen design. Lastly, the AnTuTu has also revealed that it has an internal storage of 64 GB. The renders of the Galaxy C10 have suggested that it will be arriving with a vertically arranged dual camera setup on its back panel. Since the C10 is expected to arrive with a 16:9 aspect ratio screen of 6 inches, it is likely to feature a front-mounted fingerprint scanner. It is rumored to come with a huge battery of 4,000mAh capacity. Rumors from last year have claimed that the handset may be priced around 3,499 Yuan (~$560). It is expected to come in colors like Rose Gold, Pink and Black. As of this writing, there is no information available on the launch date of the Galaxy C10.